The U.S. government has established the goal of producing at least 16 billion gallons of the mandated advanced biofuels from cellulosic biomass feedstocks by 2022. One of the main steps in realizing this target is the development of technologies that can break down the cellulosic materials into the component sugar molecules, which are then converted into biofuels. This process requires a cocktail of enzymes (proteins that catalyze chemical reactions), with the main ones capable of being produced using Infinite Enzymes’ plant genetic technology. Part of the present challenge to cellulosic biomass conversion is the large amount of capital investment required for the existing system of industrial enzyme production – i.e. microbial/fungal fermentation of enzymes. For example, a 50 million gallon per year cellulosic biofuel facility requires 1.5 million kg of cellulase enzymes annually. Using a microbial fermentation system to produce these enzymes would require a $100 million upfront capital investment (for tanks and associated infrastructure and control systems), as well as $15 million in annual operating costs ($10/kg enzyme). Alternatively, to produce these enzymes using Infinite Enzymes’ plant-based cellulase production system would require a $2 million capital investment (for dry milling and defatting equipment) and $11.7 million in annual operating costs ($7.8/kg). Since the corn starch and oil can be sold to offset the cost of production of the corn, there is potential to further reduce this operating cost. 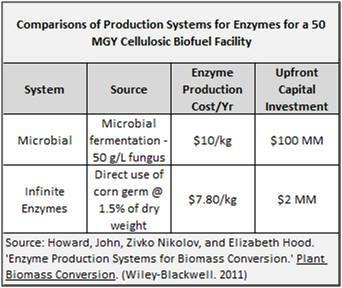 For facilities already using microbial enzymes there is the opportunity to introduce Infinite Enzymes’ cellulase enzymes to enhance their cellulosic biomass conversion process and reduce operating costs. The benefits of a successful cellulosic biofuels industry will be tremendous, not only for biofuels manufacturers, but also for American national security and economic development. In addition to decreasing America’s dependence on fossil fuel imports, American-made biofuels will also help improve the security of fuel sources for the U.S. military. Just as importantly, a multi-billion gallon cellulosic biofuel industry will offer new jobs to support rural communities and farm households and provide needed economic development for many agriculturally dependent areas. According to experts, the manufacturing of cellulosic biofuel to meet the 16 billion gallon target would directly employ over 24,000 workers, as well as support thousands of additional jobs in feedstock harvest and transportation (source: Agricultural Marketing Resource Center. ‘Renewable Energy Newsletter.’ February 2009).